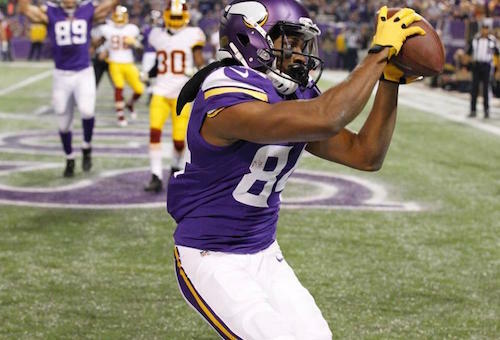 The name Cordarrelle Patterson causes most fantasy owners to cringe and commonly used when discussing the term bust. Most fantasy football players are savvy enough to know that NFL draft spot and slot is one of the best predictors of fantasy success. However, there are exceptions, which I will attempt to identify in this article. Jon Moore created the Phenom Index during his time at RotoViz, which he used to predict players who could and should outperform their draft spot. While Jon Moore was uncovering best value WRs in dynasty rookie drafts, we will focus on the worst value players. Rather than buying lottery tickets, we seek to identify the stay-away players. The same GMs who have watched thousands of hours of tape, interviewed friends and family members of players, as well as gone and watched these very players they are drafting live across the country. Without watching a single minute of tape, by building on Jon Moore’s work, we can be smarter and better at predicting and avoiding the dreaded bust. Alas, there is no worse feeling than hoarding your first round rookie picks for your dynasty draft only to pick the next A.J. Jenkins. I then collected and analyzed data from NFL wide receivers drafted between 2010-2014. I cut the data off at 2014 since most top wide receivers have some sort of breakout in their first or second year. After excluding players with incomplete data (no Breakout Age and/or College Dominator Rating available) I was left with 220 remaining NFL wide receivers. There were sixteen drafted in the first round and twenty drafted in the second round. Using PPR scoring (1 point per reception, 0.1 point per 10 yards, and 6 points per TD) I evaluated which players were at least a WR1 or WR2 in a 12 team league in any given season from 2010 to 2016. 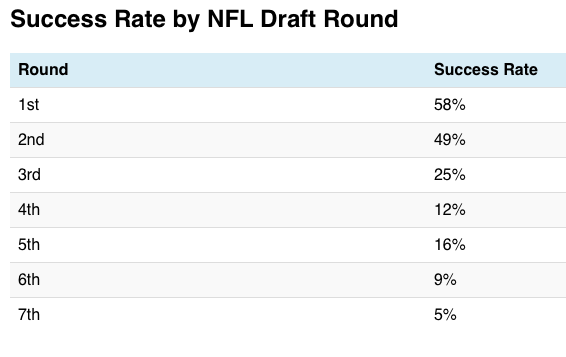 The “hit rate” by only using the NFL draft was 81-percent (13 of 16) for first round picks, 30-percent (6 of 20) for second round picks, and 25-percent (5 of 20) for third round picks. Upper percentile College Dominator Rate, a blazing 4.39 forty-yard dash as well as large Catch Radius, and 78th-percentile SPARQ-x score! “What’s NOT to like! !” Quiet down, Trent Baalke! I am doing the analysis here. So what could have tipped us off to avoid Jenkins, who many billed as a “late bloomer?” The Phenom Index uses College Dominator Rating AND age in college when drafted. Jenkins’ Phenom Index is off-the-charts at 2.79. Well, here is where Breakout Age comes into play. Breakout Age is defined as age a player achieves a 20-plus-percent College Dominator Rating. While his metrics were off the charts, his Breakout Age is below the 50th-percentile. Only Kelvin Benjamin had an older Breakout Age of the first round players in this analysis. This also raises more red flags for Benjamin going into this year in my opinion, but that’s a topic for a different article. A.J. Jenkins went on to be cut by Dallas Cowboys this off season after amassing a whopping 37 receptions for 223 yards and no TDs in 3 years and 28 games. Furthermore, the 49ers could have selected Alshon Jeffrey 15 picks after Jenkins. Ouch!! Coincidentally, Jon Baldwin was involved in a trade for our first player, A.J. Jenkins in 2013. I’ll trade you my motorcycle with no wheels for your car with no engine. There were several red flags which identified him as a potential bust. Jon Baldwin‘s draft stock slipped into the late first round after reports of “character issues” surfaced heading into the NFL Draft. These included everything from work ethic concerns to an arrest in 2009. Despite his prototypical 6-4 and 230-pound frame with an impressive College Dominator Rating and Breakout Age, we need to dig a little deeper into his college numbers; especially if we are going to use one of our first round picks to essentially overlook possible character issues. In his senior season at Pitt in 2010, the team averaged 27-plus passes per game, yet Jon Baldwin as the biggest and No. 1 target only had 5 TDs and his receiving yards regressed from his junior to senior season from 1,111 down to 822. Like Stephen Hill, Baldwin was productive at the college level, but not dominant. Given his exceptional workout metrics, Baldwin clearly underperformed his athletic gifts at the college level — a significant red flag on any prospect profile. Tavon Austin at 5-8 was a gadget player who was an NFL reach based on overvaluing an impressive 4.34 second 40-yard time. The tip off on the Tavon Austin profile is the low College Dominator Rating. If you are going to expect someone to be the exception at 5-8, everything else better be special. His Dominator Rating was below average at 43rd-percentile and college yards per reception was only 10th percentile. Austin will always be dependent on an offensive coordinator willing to scheme to get him in space on jet sweeps, orbit action, etc. His inability to thrive in the slot as many had envisioned makes him a special teams and gadget player. Good for best ball, think Dexter McCluster when he came out of Mississippi, but nothing more than a flex play in fantasy. If there is one player who may end up underperforming since 2015, Devin Smith would be the guy to pass on. Along with fact that has two top WRs in front of him in Eric Decker and Brandon Marshall while also playing on a run heavy offense in New York, his underwhelming College Dominator Rating along with average Breakout Age suggests he will be the deep threat who may be good in best ball leagues, but otherwise will likely just be a roster clogger. I hope these lessons from 3 busts will help you avoid wasting those first round rookie picks we all covet so much just because the NFL thinks they are worth it. But now, as fantasy GMs we know better.